Shahla Haeri is the director of Women’s Studies Program and an Associate Professor of cultural Anthropology in the Department of Anthropology at Boston University. She has conducted research in Iran, Pakistan, and India, and has written extensively on religion, law and gender dynamics in the Muslim world. She is the author of No Shame for the Sun: Lives of Professional Pakistani Women (Syracuse University Press in the US, and Oxford University Press in Pakistan, 2004), and Law of Desire: Temporary Marriage, Mut’a, in Iran, 4th edition (2006). 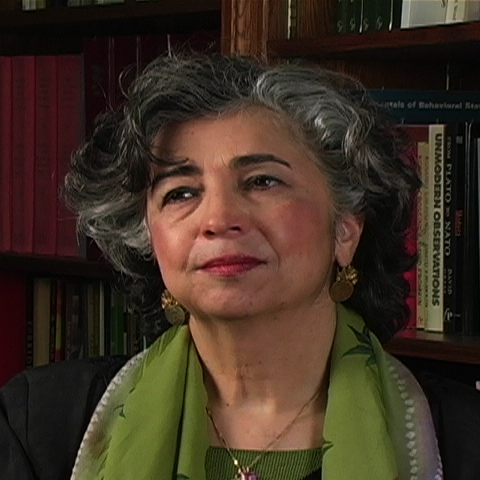 She was involved in the University of Chicago’s multi-year program on global fundamentalism, Fundamentalism Project, which was funded by a John D. & Catherine T. MacArthur grant, and contributed an article to the second volume: “Obedience Versus Autonomy: Women and Fundamentalism in Iran and Pakistan” (1993). She has been awarded several postdoctoral fellowships, including one at the Women’s Studies in Religion Program, Harvard Divinity School (2005-2006), Fulbright (1999-2000, 2002-2003), St. Anthony’s College, Oxford University (1996), Social Science Research Council (1987-88), Pembroke Center for Teaching and Research on Women, Brown University (1986-87), and the Center for Middle Eastern Studies, Harvard University (1985-86). Dr. Haeri made a short video documentary (46 min.) entitled, Mrs. President: Women and Political Leadership in Iran, focusing on six women presidential contenders in Iran in 2001. This documentary is distributed in the United States and Canada by the Films for the Humanities and Sciences (www.films.com, 2002). How did unveiling affect women during the Pahlavi dynasty? Why did Reza Shah order an end to veiling? What are the origins of veiling in Iran? Why do women in Iran wear the hijab or chador? How did Mohammad Reza Shah change the legal status of women? What are common misconceptions of Muslim women? What role do women play in politics in Iran? Do women and men have the same opportunities in Iran? How did increased access to education affect women after the revolution? What was the new government’s policy on veiling? Why was the 1979 revolution widely supported?